I'm gonna keep this one short and sweet because I am really tired and I have a lot to do tomorrow. Thanksgiving! That will come in another post. This month's DB challenge was to make something that has been on my baking bucket list forever – say it with me (if you can) – sfogliatelle. I could never get motivated because they are sooooo much work. But I kind of found a shortcut. So if you've had sfogliatelle, you might be like, "Rebecca, imposter, that's a hand pie, not the flaky, beautiful pastry I love". To that I say...shush. 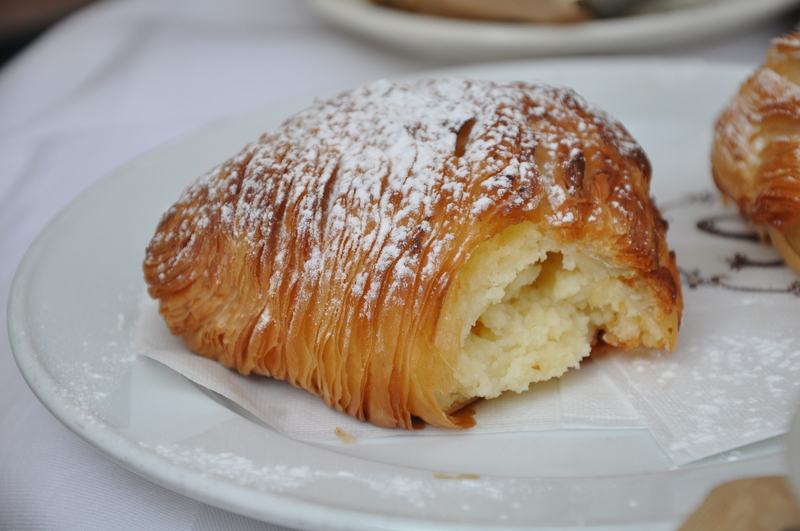 There are two types of sfogliatelle – ricci and frolle. Ricci is the beautiful kind with a million layers, and the one I did not make. I make frolle, which is much easier and more like piecrust. The filling is comprised of homemade ricotta and a sweetened semolina paste. Someday, when I have more time and resources, I'll tackle the ricci. But for now...I'll just amuse myself by saying sfogliatelle over and over again. 1. Line a large colander or strainer with 2 layers of lightly dampened cheesecloth over a large glass; set aside. 2. Pour the whole milk, heavy cream and salt into a large pot and bring to a boil over medium heat, whisking occasionally. Reduce the heat, add the fresh lemon juice and stir/whisk continuously for 2-3 minutes. The mixture will curdle, which is exactly what you want it to do. Pour this into the cheesecloth lined strainer and let it drain for about 1 hour or until it comes to room temperature. At this point you can scrape the ricotta from the cheesecloth into a container and refrigerate for up to 2 days. 3. You will be left with a crap-ton of whey. Apparently it makes an excellent soup stock ingredient and liquid replacement for water or milk in bread. Here is an excellent article on the wonders of whey! (This recipe made way more filling than I needed. Prolly could have halved it). Combine the milk and the sugar in a medium saucepan. Bring to a boil, then lower the heat and slowly add the semolina (or cream of wheat), whisking quickly as to avoid any lumps. Cook, stirring often, until the mixture is smooth and thick, about 2 minutes. Spread the mixture onto a lined baking sheet, about 1/2 inch (15 mm), to cool. When cool, break into pieces and place into the bowl of your stand mixer, fitted with the paddle attachment (or a food processor), and add the ricotta cheese, egg yolks, vanilla and cinnamon. Beat until very smooth and creamy. Stir in the candied orange peel. Scrape into a container, place plastic wrap directly onto the surface and refrigerate until needed (up to 3 days). Combine the flour, sugar and salt in a mixing bowl. Remove the butter from the fridge and pound it a few times with a rolling pin to make it pliable. Add it to the flour and start rubbing it into the flour mixture with your fingertips, working from the bottom of the bowl upwards. Work quickly so the butter doesn't get warm from your hands. This only takes a minute or two to complete. Add the eggs and stir into the dough with a fork until it starts to hold together. Empty it out onto your workspace and knead it a few times. Shape into a disc, wrap in plastic and chill until firm. The dough can be made up to 3 days in advance. Prepare the filling and chill it. Whisk the egg yolk, egg and salt together for the egg wash.
Divide the dough into 10 equal pieces. Roll each piece into 5 inch (12-1/2 cm) rectangle . Place a hefty tablespoon amount of filling on the lower half of the dough and pull the top half over this. Use your hands to press down around the filling and seal the edges together (like making ravioli). Use a 3 inch (75 mm) round cookie cutter (or glass) and cut away any excess dough. Brush the frolle with the egg wash and bake approximately 20 minutes, just until the frolle are baked through. Cool briefly on a rack.